A good cup of coffee is probably one of our single favorite simple, yet elegant pleasures on earth. Whether it is a piping hot mug of joe in the morning or a latte in the afternoon (or both), we savor every sip. We can almost smell the distinct aroma of coffee roasted to perfection and feel the steam rising up to our faces. Mmmmmm. If it’s made from quality grounds, coffee can take you to another place. For us, that place is New Orleans. 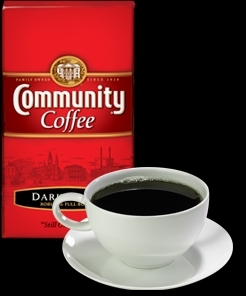 We’ve been using Community Coffee (Medium Roast, $5.49 per 16 ounce bag) for the past couple of years and have yet to find a “house coffee” we like better. We prepare ours in a French press, which doesn’t take any longer than using an automatic drip coffee pot, yet it tastes so much better and the ritual is of course part of the allure. Perhaps we love this brand a little more than most, because, again, it reminds us of trips to New Orleans. Also, it was introduced to us by a dear friend. Either way, it is worth the extra dollar or so at the grocery store. Find your favorite coffee, brew and enjoy. Oddly enough, yours truly has never (ever) had a cup of coffee. Most view this as a good thing, believing additional stimulants are unnecessary. Ha! Really? I’ve met a few coffee “teetotalers” in my time and find it facinating, if only because I can’t fathom anyone, after smelling coffee, not wanting to try it. Also, I’ve always thought that coffee was mandatory for those of us in the journalistic arts. No? I too should probably abstain, given my high-energy (nice way of putting it) personality, but it’s just so yummy!